Dean Kiely has left Charlton to joing Portsmouth today after 6 years of service for the mighty Addicks. 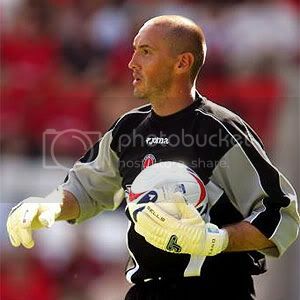 Despite falling out of favour, Deano will always be remembered for some of his amazing performances which meant we finished 7th in 2003/2004 in the league, his penalty save against the Palace last season as well as the many chants of "Deano whats the score, Deano Deano whats the score" to which he always responded. It will be good for the man to have a fresh start and hopefully use the little left of his career to his full potential and I wish him well in the future. One last time - DEANO DEANO DEANO DEANO!